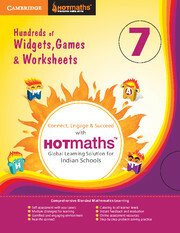 HOTmaths is a Global Learning Solution in Mathematics for Indian Schools. HOTmaths is a Global Learning Solution in Mathematics for Indian Schools. It is a comprehensive, blended mathematics learning system combining suite of flexible resources that helps children grasp, comprehend and apply concepts in their everyday lives. It is accompanied with the HOTsheets which are the printed worksheets that help children check their learning and provide an opportunity to practice using pen/pencil and paper. These are thematically mapped with the portal. Each HOTsheet begins with a clearly defined learning objective. Variety of questions and interesting activities in a well-graded manner help develop critical thinking including higher order thinking skills. A clear learning objective focus for each activity consolidates and reinforces learning through various logical and engaging activities and problems. Focuses on developing problem-solving abilities. Task: Well thought through problems and activities to motivate student to think and apply the knowledge gained through portal. Extension: Activities to build a strong platform for concepts and develop capability to comprehend more complicated concepts at the secondary level. The Parent’s Guide help the parents to guide their children to use the Cambridge HOTmaths resources effectively. The book is designed to help parents make mathematics more meaningful and understandable for their children. The parents can become their child’s partners in practising mathematics. Lesson Notes take a student through a lesson with step-by-step explanation of the topic. Widgets are interactive in nature. These integrate Maths Lab Activities with the topics. Hotsheets are practice sheets based on the topic the students are learning.